Treat your bacon-loving canine to the irresistible flavor of the Blue Buffalo Blue Stix Bacon Soft-Moist Dog Treats. Made with USA pork as the first ingredient, these pepperoni-style treats don’t just taste great, but are loaded with wholesome ingredients for a boost of nutrition in every bite. Since they have no chicken or poultry by-product meals, corn, wheat, soy or anything artificial, you can feel good about giving them every day, during training or anytime your pooch deserves a tasty reward. 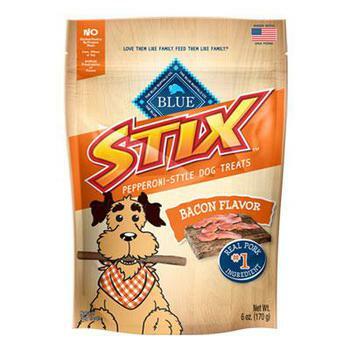 Made with USA pork as the first ingredient for the high-protein treat dogs find irresistible. Pepperoni-style with a soft texture and natural bacon flavor, it’s great for training or snacking anytime. With wholesome ingredients like oatmeal, potatoes, brown rice, blueberries and carrots. Can be given whole or cut into smaller pieces that are great for training and for smaller dogs. Made in the USA with zero chicken or poultry by-product meals, corn, wheat, soy, or artificial preservatives or flavors.